I want to start with the lyrics of a song but this month, I can't. I just don't have it in me this morning, or the time. If only I had something, like a plugin that I could install, that speeded everything up but kept me sane. 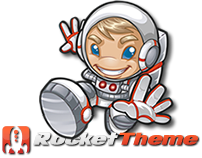 Something a little like RokBooster, a new plugin for Joomla from RocketTheme that keeps everything working but just makes it faster. Best of all, it is free! But that is just a bonus this month for everyone. The real news is the new release from RocketTheme and this month it is called Voxel. If you didn't know a voxel is the 3D equivalent of a pixel. So, where a pixel is the smallest sample element in a 2D image, the voxel is the smallest sample element in a volume image. The word “voxel” is a combination of “volumetric” or “volume”, and “pixel”. Yes, that is the type of stuff I just know. Okay, not really, I found it here. And after that, you really should go have a look at it and if you want, go download the new plugin, especially if you are running Joomla 2.5, because it doesn't work on anything else.